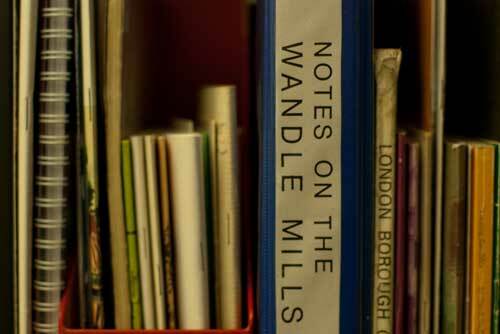 We have a small library of books and pamphlets relating to the industries and buildings of significance located along the banks of the Wandle. Our subjects range from Archaeology to Windmills. We also have historical maps, illustrations, newspaper cuttings, articles from professional journals, some personal reminiscences, and the beginnings of a name index identifying mill owners, textile workers, and famous people who lived in the area. There are copies of some of the textile and wallpaper designs from Liberty and William Morris, and some unique multi-volume unpublished material relating to the mills and industries of the Wandle. Please note that facilities for research are limited so please let the museum know in advance when you would like to consult our resources and give us some indication of what you are looking for. We can then make sure that the information you need is accessible at the required time.